The Terrible Towels keeps waving, the Jolly Roger still rises, and the Pens continue to go. This industrious Pittsburgh, home to Andy Warhol, a colleges’ city, and strong sports teams, has triumphed. On game day, Market Square appears in a perfect mix of business and fandom as the pep rally starts. Suited businesswomen carrying leather bags walk next to a black-and-gold horde of rallying, beer-swigging sports fans. “Let’s go Pens! 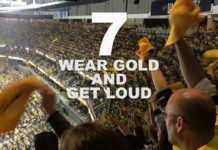 Let’s go Pens!,” they all chant together. The cheers of the pep rally resonate through the streets of downtown Pittsburgh as the crowd moves east, toward the Consol Energy Center. Everyone is angling for the best spot in front of the big screen just outside the arena. That infectious energy feels palpable in this city even on days when it’s not facing down a Stanely Cup playoff. From work to sports, steel to robotics, Mr. Rogers Neighborhood to a millennial mecca, this city of 304,391 inhabitants knows how to embrace change. Three decades ago, the steel industry evaporated, creating an economic and social disaster. In 1983, the unemployment rate skyrocketed to 17.1 percent, and 212,000 found themselves jobless. But the United Steelworkers union (USW) and its counterpart, the U.S. Steel Corporation, remain here, as well as the Steelers, who continue to pay homage to the industry through the three hypocycloids (diamonds) in their logo, which is based on the American Iron and Steel Institute’s emblem. As the steel industry began to falter, the wealthy families connected to the industries that built Pittsburgh — Carnegie, Frick, Mellon, and Heinz — refused to abandon a town they helped create. Andrew Carnegie, who, as a kid couldn’t afford to pay the $2 subscription to his local library, became the creator of the first public (and free) library in Braddock, Penn in 1889. And Jack Heinz (1908-1987), former CEO of H. J. Heinz Company and chairman of the United War Fund, funded the rebirth of Lowe’s Penn Theater in the 1970s, providing a home for the Pittsburgh Symphony. That building, now known as Heinz Hall, facilitated the creation of a “Cultural District,” a 14-square block of retail shops, restaurants, theaters, and dozens of art galleries, which serve as a catalyst for urban development and tourism. But it’s the city’s tech boom that helped it earn the name of “Roboburgh,” as The Wall Street Journal called the city in 1999, a nod to the town’s burgeoning robotics industry. In fact, Pittsburgh, despite its steely reputation, has long been a city known for its intellectual pursuits. About 40 colleges and universities – among them Carnegie Mellon University and the University of Pittsburgh, the crown jewels – call this city home, but there’s also nanotechnology, bioengineering, and a hospital hub led by UPMC, one of the leading healthcare providers in the world. NASA using CMU navigation software for its Mars Exploration Rovers and a CMU student, Scott Fahlman, invented the emoticon, making the Iron City known worldwide. Michal Chabon, Pulitzer-Prize winning author who attended both CMU and the University of Pittsburgh, featured the city in his first novel, The Mysteries of Pittsburgh. “If people are looking for hope, it’s here. You can have a decent economy over a long period of restructuring,” says Sabina Deitrick, urban studies expert at the University of Pittsburgh, speaking about the city’s millennial boom in an interview for The New York Times. The UPMC Tower (formerly known as the U.S. Steel Tower) serves as the highest point in downtown, and the whole area, called Golden Triangle, is a glittering bow at the center of three rivers — the Allegheny, Monongahela, and Ohio. It’s a miniature pastel Manhattan. Walking around Market Square, jaw dropped, some might wonder where this beautiful gem has been hiding. A view of “The Golden Triangle” from Mt. Washington (photo credit: Jourdan Bennett-Begaye). 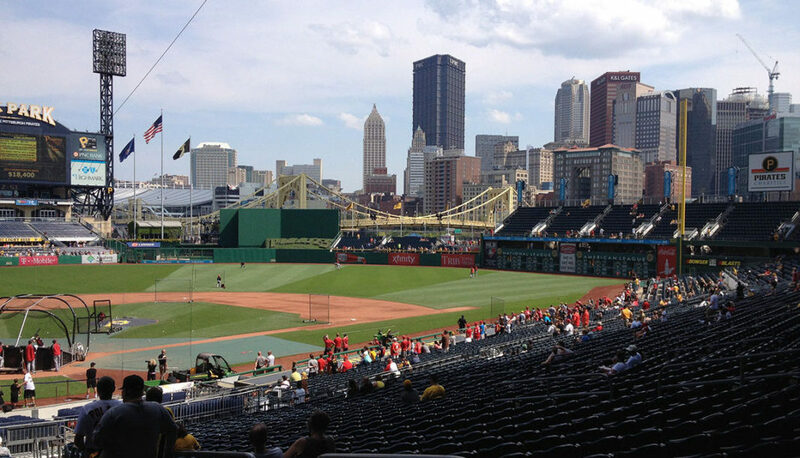 Of course, most travelers know about Pittsburgh’s sports teams. They rank second in the all-time number of championships won (Boston is first), despite lacking a basketball team. They also are the only city to rep the same two colors for all their teams — black and gold. 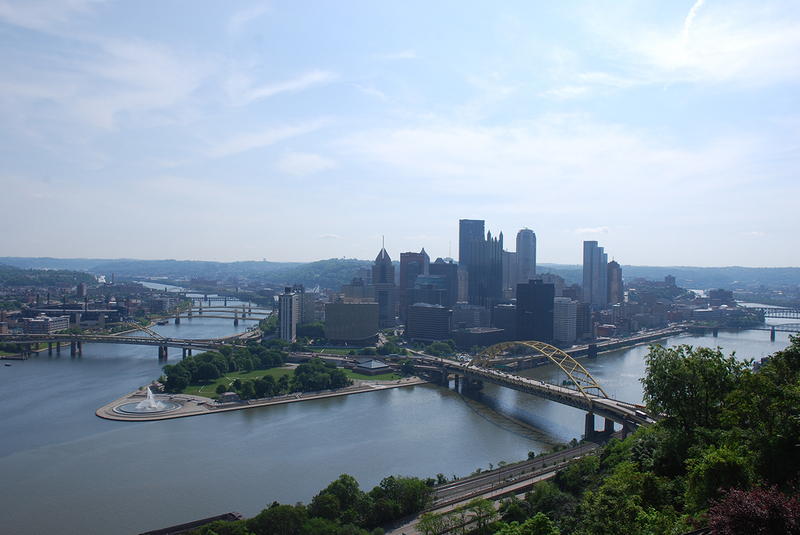 The Pittsburgh iconic color scheme dates back to the city’s origin. In 1816, William Pitt’s coat of arms became the city seal. It was a way to commemorate the first Earl of Chatham and British’s prime minister. On the crest, three gold bezants (Byzantine coins) stand on a black background adorned by a blue and white checkerboard pattern, which is used to evoke the Pitt family and the commercial soul of the city. The words Benigno Numine (by the favor of the heavens) surround the crest, reminding that everyone needs protection from up above. 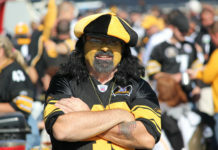 The Steelers have more than their share of heavenly protection with six wins out of seven Super Bowl appearances. But another Pittsburgh team lacked favor for 21 years. That’s how long the Pirates missed the playoffs (1993-2013). But the heavens opened up for the Penguins and their fans this year. They clinched the 2016 Stanley Cup. “Let’s go Pens!” radiates from inside Buford’s Kitchen, the Penguins’ den, just across the street from Consol Energy Center. “If I wasn’t a sport fan, I had no choice but to be, because the fans will make you. The way the adrenaline goes and the way they celebrate, I love it,” says Tamesha Wagner, assistant general manager at Buford’s Kitchen. 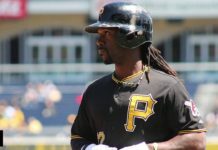 At Buford’s Kitchen, Pittsburgh sports rules with the Pirates’ signature beer, I.C. Light (photo credit: Federico Ghelli). At Buford’s, bartenders create drinks based on their favorite hockey players. 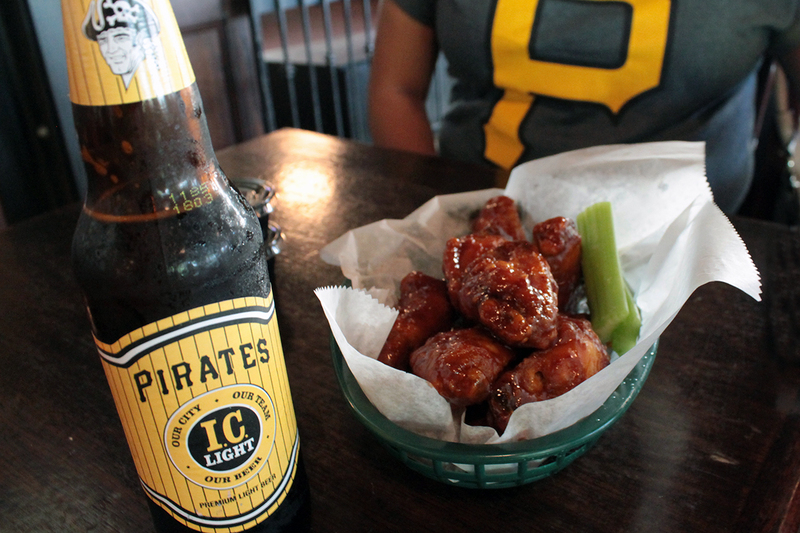 Even Pittsburgh’s food and drinks exude sports. Many venues across town create dishes and drinks to celebrate their sports heroes and teams. There’s a sandwich version of the Penguins’ third line, the Pirates’ signature beer, I.C. Light, and people who find it entertaining to pair food with their Steelers favorites. But, most of all, Pittsburgh is easy on the eyes. On the Duquesne Incline, opened in 1877 to provide easier access to Mt. Washington, silence reigns as the cheering fades and the bustle of Market Square disappears. At the top of Mt. Washington, Pittsburgh appears shiny and green in the early hours of morning. The grandiosity of Heinz Field and PNC Park stand on one side and the skyline of the Central Business District stretches out on the other. Three rivers snake in between and countless, fading yellow bridges dot the landscape. “The City of Bridges” boasts 446 in total, even more than Italy’s famed Venice. I stand against the railing and try to count them all, but surrender and return my attention to the flowing waters and the start of the day. Federico Ghelli is originally from Rome, Italy. He has a master’s degree in magazine, newspaper, and online journalism from the S.I. Newhouse School of Public Communications. 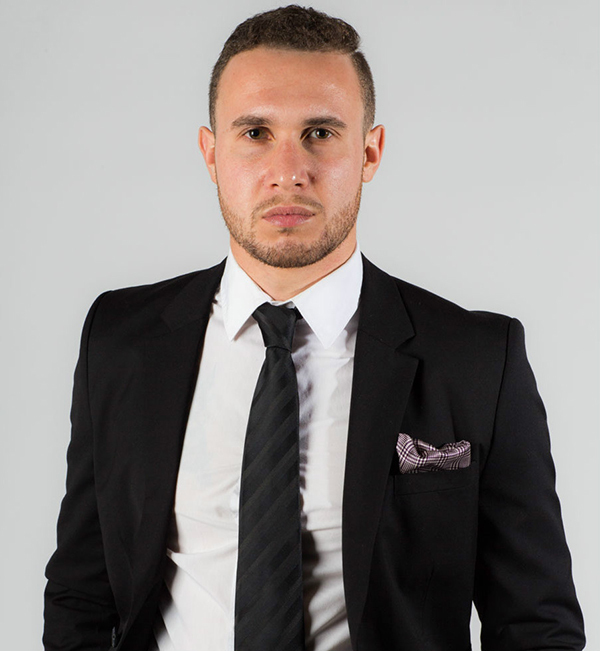 In 2015, Federico graduated as salutatorian of his class from The Lincoln University with bachelor degrees in print journalism and broadcast journalism. As a true Italian, Federico is a soccer fanatic; he wouldn’t miss an AS Roma game for anything in the world. Traveling, photography, and sports are among his passions. He loves adventures, and his biggest dream is to work for a travel publication.